Wow, a lot of sound comes out of this little speaker, I was pleasantly surprised. I got the green one and it looks great. It has almost a military look to it. It seams very durable, well made and has a nice weight to it. The sound on high isn't totally crisp, but it's not bad. I can get it pretty high before it gets a little scratchy. There's not a lot of bass, but it's not bad for a portable speaker. Connecting the Bluetooth to my Samsung Galaxy S5 was easy. Battery life wasn't bad, I did get about 10 hours. I tried it in the shower and it worked well. Overall, I'm pretty happy with it. My husband loves it. He brings it to work everyday to listen to it while setting up before opening. 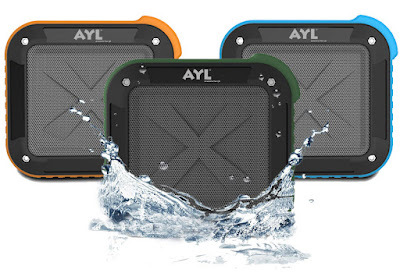 If you would like to try this AYL Portable Bluetooth Outdoor/Waterproof Speaker for yourself, you can purchase it right now from Amazon!